Here, you will read about free Instagram quotes maker Android apps. It is so easy to use these apps and create good quotes in just a few minutes. You can make your writing look effective. After installing the app, you can use different quote templates. There are several tools which you can use to make effective quotes. The tools list include text style, font size, background color, text color, alignment, shadow, overlay, etc. You can also add a picture from phone gallery in order to write over your image. The apps let you write on a plain background or on beautiful images as well. A few people like to write their own quotes. These apps are a great option to type text with awesome tools. Then, you can save the image on your phone. Also, you can directly share the quote on your Instagram account. The apps let you search for random quotes created by famous authors like William Shakespeare, Mark Twain, etc . You can also make Instagram look interesting by using grid simulator Android apps. Let’s create quotes using Instagram quotes makers. Quotes Creator is a free Instagram quotes maker. Using this app, you can make quotes using background templates, fonts, effects, colors, etc. Also, you can find random quotes by authors. When you open this app, you will see a blank image. You can double tap to type your text. There are other designs which you can use to create quotes. The app lets you manage the templates. To do so, you can tap on the settings icon, then manage templates. You can change the colors of the background. There are so many shades of each color. You can make quotes gradient backgrounds. The app has other tools like background, fonts, text, colors, effects, shadow and property. You can add images from your phone gallery as a quote background image. While creating a quote, you can adjust text size, alignment, line space, letter space, and frame width. The app has 180+ font styles. You can change text color as well. Besides that, you can add effects like blur, hue, brightness, contrast, saturation, shadow, etc. Thereafter, you can save the image or save templates. And then, post awesome quotes on your Instagram account. Geulgram is another Android app to make quotes for Instagram. The app lets you create quotes in different ways. When you open the app, you will see options like writing on beautiful photos, Color background, and My photos. The app has several backgrounds which are categorized as popular, dusk, forest, pastel, wall, wood, etc. You can choose any of the images from categories. And then, you can start typing your text on them. If you don’t want to write on pictures then you can use plain color backgrounds. Once you tap on the background, it prompts to choose a quote size. There are options such as square, vertical, horizontal backgrounds. A few are so interested in writing quotes over their own picture. Using this app, you can write quotes on your photo. The photo can be selected on your phone. While making a quote, you can use tools like background style, font size, and style, color, and alignment. Other tools such as text effect, add a sign, add date, and add subtext. After creating the quote from this app, you can save it. All the saved quotes store in the My geulgram folder which you can edit as well. Quotes Creator can be a good option as Instagram quotes maker. When you open the app, you will options such as category, authors, create quotes, saved quotes. There are more than 25 categories. It includes inspirational, life, happiness, age, courage, wealth, business, and others. You can tap on any category to view the quote template related to that category. You can search for quotes by famous authors. The author list consists of Mark Twain, William Shakespeare, Albert Einstein, Mahatma Gandhi, etc. If you tap on any of the authors then it shows different quotes written by these authors. Then, you can directly copy and share on Instagram. To create your own quote, you can use text, image from your phone gallery, background, shape, frame, stickers, etc. You can save quotes as well. The app also lets you view online quote with beautiful designs. Picture Quotes and Creator is another Instagram quotes maker Android app. After downloading the app, it prompts to give permission to save images in phone storage. The app has a lot of motivational quotes with different designs. To create quotes, you can tap on the icon on the top right. Then, you can start typing the text to make a quote. There are so many beautiful backgrounds to use for making quotes. You can use different text size, frame width, stylish fonts, space between letters and line. Also, you can change the font color, shadow, overlay. The app lets you add an image from your phone image gallery. Then, you can use these tools to create a quote. After creating the quote, you can save it in your phone in three image size; default, large, extra large. 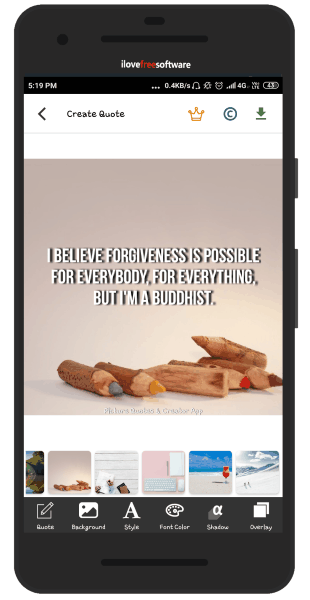 Quote Writer is a free Instagram quotes maker app for Android. The app seems very simple. It lets you create quotes on white and black background. You can create quotes by using different features. The app has tools like align, bold, and color. When you open the app, you can type the text on the background. Then, you can adjust the alignment of the text just by tapping on align. Also, you can make the letters bold, change the color of the background from white to black After making the quote from this app, you can save it in your phone. You can directly share this on your Instagram account as well. It is very easy to find a quote image available on the internet. But using these Android apps, you can create your own quotes. The apps have good enough tools to make your writing look great. Also, you can search for random quotes on these apps. You can save the quote image as well. So, try Instagram quotes maker and create beautiful quotes.